Simone ("Simca") Beck was born in 1904 at Tocqueville en Caux, Normandy. In 1933, she began to study at the Cordon Bleu, then the world’s supreme school of cuisine. In 1948 she was approached by a friend, Louisette Bertholle (now Comtesse de Nalèche), to collaborate on a French cookbook for Americans. In 1951, at the suggestion of her husband, they began to search for an American to help them, and a friend introduced Simca to Julia Child, then studying cooking in Paris. 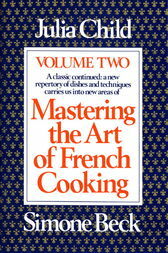 Soon afterward, the three women formed a cooking school, L’École des Trois Gourmandes, and began the collaboration that produced the several volumes of Mastering the Art of French Cooking. She died in 1991.